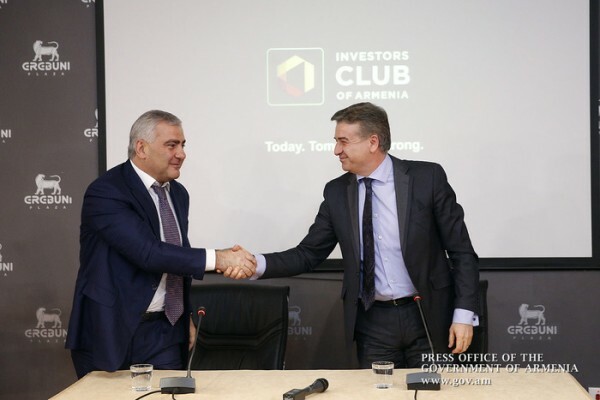 Attended by Prime Minister Karen Karapetyan and over 30 Armenian entrepreneurs from Russia, the Armenia Investors Club (AIC) non-public contractual investment fund was officially launched today. Note that on January 25, 2017, Russia-based Armenian businessmen issued a statement on support of the process of deep reforms in Armenia and participation in joint initiatives and the business programs of the Government of the Republic of Armenia. “I know personally each member of the Club; I have friendly relations with most of them. In fact, the Club will be crucial for us - not only because healthy, long-term investments and business programs are expected, but also because we are introducing a new corporate culture. During meetings with our citizens, I repeatedly said that many countries that have achieved qualitative changes during the last 20-30 years have had no fewer problems than we have. But their courage, pretentious programs, pragmatism and rationality, their will, purposefulness and, in some cases, their stiffness led to changes. Why can we not have a better country? Why can others, and we - not?” the Prime Minister said. Stressing that each AIC member has set an example by creating a business empire, Karen Karapetyan said their commitment might trigger qualitative changes in Armenia. “Besides, each of the members of the Club has a large circle of friends, and the Club may become a bridge between their connections and our country. The Club’s activities will help us eliminate financial and capital market shortfalls and gaps in Armenia. With their moral image and behavior, the members of the club will also introduce a new culture into the business elite in Armenia, which is extremely important. I welcome and express my deep gratitude to all of you. I would like to extend a special vote of thanks to our comrade, Armenia’s great friend, philanthropist, investor Samvel Karapetyan. None of you can imagine what an important work you have done. I am sure that the cooperation between the Club and the Government of Armenia will be very predictable and understandable. One thing can be stated clearly: we are partners of every businessman, and you will always feel that aspiration of ours. I am eager to see that the Club is successful, for which there is a sound basis – it is not a team of philanthropists, but an aggressive business club,” the Prime Minister of the Republic of Armenia concluded. Armenia Investors Club is a non-public contractual investment fund registered with the Central Bank of Armenia. It will try to involve domestic and foreign private funds to promote important sectors of economy: energy, including alternative energy, energy and tourism infrastructure, mining, ore processing, food and light industries.